In my previous articles on hacking Facebook, we learned many techniques for hacking Facebook accounts like Social Engineering, Phishing, Keylogging, Tabnabbing, and 3 friend password retrieval. Today I am going to explain how to hack Facebook account passwords which are saved in web browsers in less than 5 minutes. I’m sure you’re thinking that we can view saved passwords easily by going into settings and then saved passwords in web browsers. But what if saved passwords are protected by a master password? This Facebook password hacking technique will work on all web browsers available in market. Normally people save their passwords on their personal laptops or computers to avoid typing and remembering passwords again and again. To add additional security to stored passwords, all web browsers provide master password feature (or windows password) which protects other users from viewing stored passwords. 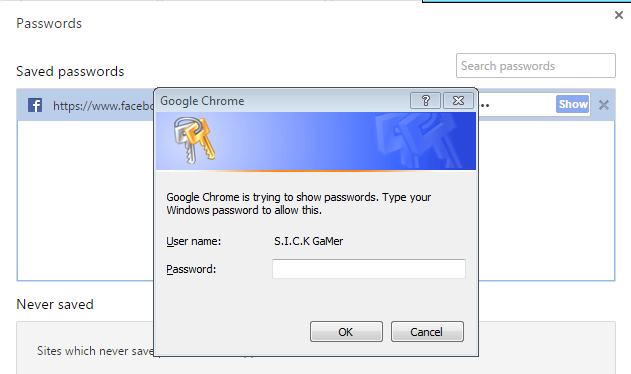 Let’s learn how to hack Facebook account passwords saved on Google Chrome. We know passwords are stored on the Chrome browser, let’s see what happens if we try to view it by going into settings and then manage passwords. If this is your own machine then it’s fine, but if it’s your friend’s device or you’re at a cyber cafe and you don’t know the password, what will you do? 5. 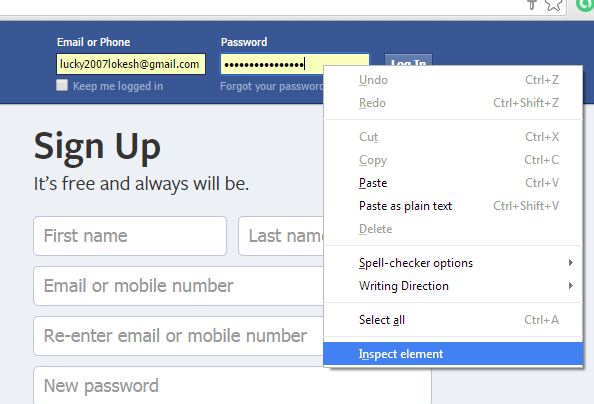 Now just check the Facebook page to view the saved password. 1. How to retrieve a password if you have forgotten it. 2. View what password you have typed. Enjoy Learning and Learn Hacking! Surprise your friends using this technique and become their Geeko :P .
hy i want to hack one a fb account can you help me??? Hey, I want to hack a fake gmail account. I dont know the email address of the victim but i can guess that (i hope). Can you please help me.